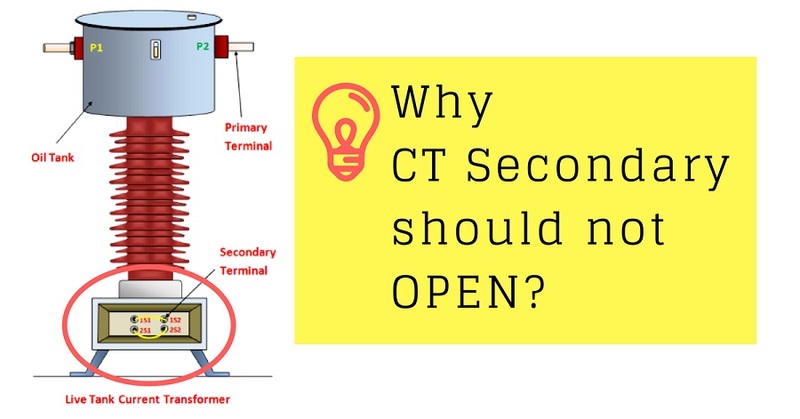 Amazed why secondary of current transformer should not be open? If it is left open it may destroy the current transformer. So it is very important that the secondary of Current Transformer should not be kept open. The reason is quite interesting. Either it should be shorted or must be connected in series with a low resistance coil such as current coils of watt meter, coil of ammeter etc. Related: Why Transformers are Rated in kVA, Not in kW? If it is left open, then current through secondary becomes zero hence the ampere turns produced by secondary which generally oppose primary ampere turns becomes zero. As there is no counter m.m.f., unopposed primary m.m.f. (ampere turns) produce high flux in the core. This produce excessive core losses, heating the core beyond limits. Similarly heavy e.m.f.s will be induced on the primary and secondary side. This may damage the insulation of the winding. This is danger from the operator point of view as well. It is usual to ground the C.T. on the secondary side to avoid a danger of shock to the operator. Hence never open the secondary winding circuit of a current transformer while its primary winding is energized. Thus most of the current transformers have a short circuit link or a switch at secondary terminals. When the primary is to be energized, the short circuit link must be closed so that there is no danger of open circuit secondary. Why Transformers are Rated in kVA, Not in kW?